Electric power is the rate at which energy is transferred. It’s measured in terms of joules per second (J/s) -- a watt (W). 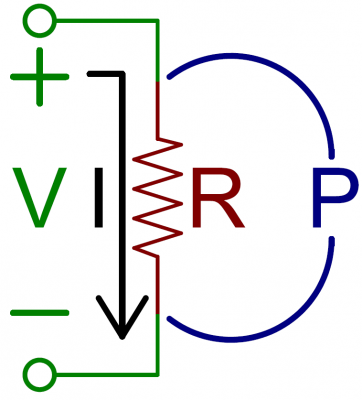 Given the few basic electricity terms we know, how could we calculate power in a circuit? Well, we’ve got a very standard measurement involving potential energy -- volts (V) -- which are defined in terms of joules per unit of charge (coulomb) (J/C). Current, another of our favorite electricity terms, measures charge flow over time in terms of the ampere (A) -- coulombs per second (C/s). Put the two together and what do we get?! Power! To calculate the power of any particular component in a circuit, multiply the voltage drop across it by the current running through it. Below is a simple (though not all that functional) circuit: a 9V battery connected across a 10&ohm; resistor. 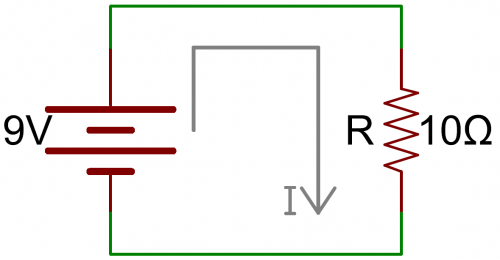 How do we calculate the power across the resistor? First we have to find the current running through it. Easy enough...Ohm’s law! Alright, 900mA (0.9A) running through the resistor, and 9V across it. What kind of power is being applied to the resistor then? A resistor transforms electric energy into heat. So this circuit transforms 8.1 joules of electric energy to heat every second. When it comes to calculating power in a purely resistive circuit, knowing two of three values (voltage, current, and/or resistance) is all you really need. So, in our previous example, 9V2/10&ohm; (V2/R) is 8.1W, and we never have to calculate the current running through the resistor. Why do we care about the power dropped on a resistor? Or any other component for that matter. Remember that power is the transfer of energy from one type to another. When that electrical energy running from the power source hits the resistor, the energy transforms into heat. Possibly more heat than the resistor can handle. Which leads us to...power ratings.